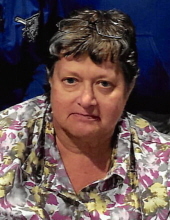 Sandra Anne Dickinson, 64, of Zanesville, died at 12:07 P.M. on Monday, January 21, 2019, at Genesis Hospice-Morrison House, Zanesville. She was born March 31, 1954, in Zanesville, a daughter of Lela L. Lake and the late Harold A. Sims. She worked at Dollar General as a lift operator and was a member of the Zanesville Fraternal Order of Eagles #302. She is survived a son, Jeremy (Jennifer) Stewart; five grandchildren, Adrianne and Jordan Stewart, Michael Scott, Katie Brooks, and Aubrey Stewart; two brothers, John Sims and Earl (Laura) Sims; and a cousin, Sue Myers. In addition to her father, she was preceded in death by a grandchild, Damian Stewart. Per Sandra's wishes a Cremation-With-Care will take place with a Memorial Service to be held at 6:00 P.M. on Saturday, January, 26, 2019 at Union Tabernacle Church, 2433 Hartford Avenue, Zanesville. In lieu of flowers, memorial contributions may be made to the American Cancer Society, 3612 Maple Avenue, Zanesville, Ohio 43701. To send a note of condolence visit www.bolin-dierkesfuneralhome.com , follow us on Facebook, or call our professional staff at (740)452-4551.